The ATL uses a Gifford-McMahon (GM) cryo-cooler to liquefy helium gas. 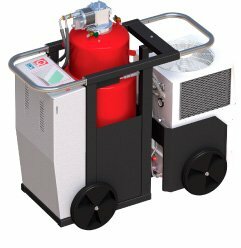 The GM cryo-cooler has a closed helium gas loop that is pressurized by a compressor. The compressed helium gas is then expanded in the cold head of the liquefier which generates low temperatures that cool down the dewar and the helium gas inside. 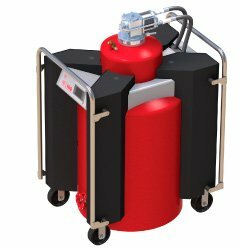 The helium liquefier has no sophisticated installation requirements and can easily be operated in any laboratory. A touch-screen panel allows easy control of the automated system. 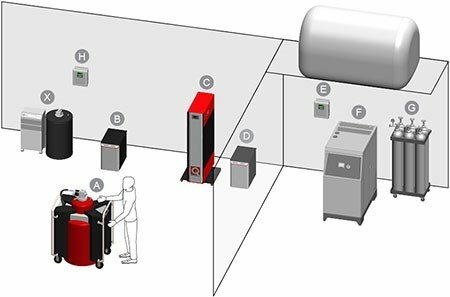 The ATL can use both helium gas from a high-pressure cylinder and recycled gas from a cryogenic experiment. Thanks to the liquefier’s outstanding design, the helium is automatically liquefied with very high efficiency. The systems feature an average rate of 12 L/d up to 30+ L/d. Depending on the mode of operation, these rates can even be higher. As an ATL unit can simply be rolled to the cryogenic experiment, the liquid helium can be directly transferred. This saves time and reduces helium losses. * Liquefaction rates vary based on transfer frequency, input helium quality and pressure. *Purifier operation varies based on input helium quality. Hydrogen contamination in liquid helium is a major cause of blocked impedances on pumped cryostats. Molecular hydrogen in concentrations as low as 0.35 ppb can form blockages. These low concentrations make it difficult to detect or remove hydrogen contamination. 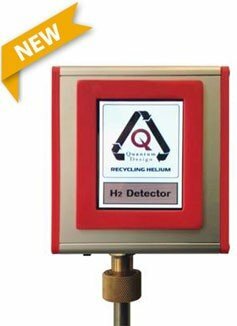 The H 2 Detector can detect trace levels of hydrogen in liquid helium and determine if the helium is safe to use in a pumped cryostat. The H 2 Removal option for the ATP30 protects instruments from hydrogen caused impedance plugs by removing trace hydrogen contamination from a recovery system. 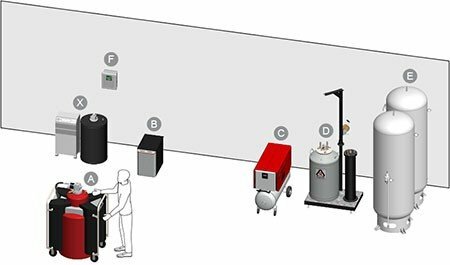 Quantum Design offers three different recovery methods to liquefy the Helium gas from your systems. 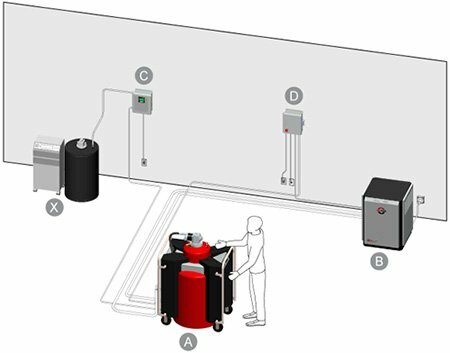 Quantum Design's Direct Recovery System is the most simple recovery system to use in order to gain the benefits of ATL80 or ATL160 liquefiers. Either liquefier model can be used with customer instrument to reclaim helium lost through normal boil off. Quantum Design's Recovery System with Medium Pressure Storage allows recovery, storage and purification of helium from normal and transfer boil off. This recovery system is perfect for customers with 1 or 2 cryogenic instruments who want to recovery almost all of the helium normally lost through normal operation and cryogenic transfers. Quantum Design's Recovery System with High Pressure Storage allows recovery, storage and purification of helium from normal and transfer boil off. This recovery system is perfect for customers with multiple cryogenic instruments or large, multi-room laboratories who want to recovery almost all of the helium normally lost through normal operation and cryogenic transfers.